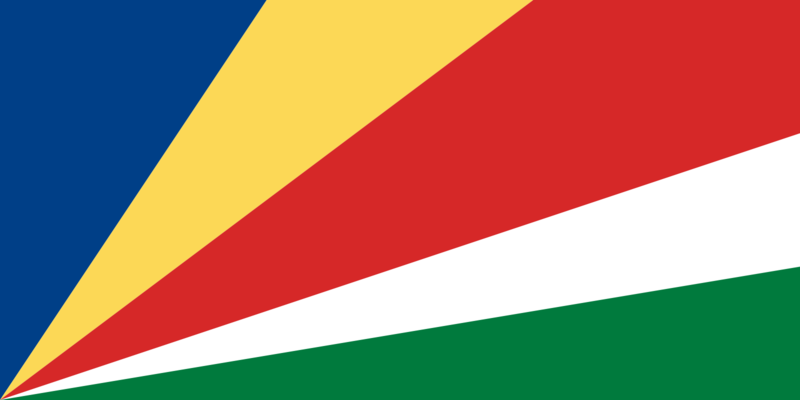 The national flag of the Seychelles was adopted on June 18, 1996. Oblique bands symbolize a new and dynamic country moving towards the future. In the national flag of Seychelles the blue color represents the sky and the sea that surrounds the Seychelles islands. Yellow is the sun that gives light and life, red symbolizes the people and their determination to work for a future in unity and love. The white stripe represents social justice and harmony. Green represents the earth and the natural environment. The original flag was adopted after independence on June 29, 1976. In 1977, when President James Mancham was overthrown by France-Albert Rene, the old flag was abolished and the red, white and green flag of the United Seychelles came into use.